1 Heat a wok until smoking and add the groundnut oil, then stir-fry the ginger, chilli, mushrooms and turmeric for a few seconds. 2 Add the bacon and cook for 15-20 seconds, then add the red pepper, carrots, beansprouts and cooked chicken. Stir-fry for one minute. 3 Add the noodles to the wok and toss for 1-2 minutes, then season with the chillies, soy sauce, oyster sauce and vinegar. Stir well to combine. Pour the beaten egg into the wok and stir gently for one minute, or until the egg is cooked through. 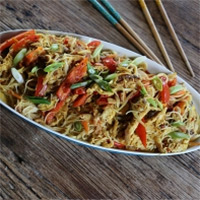 Season with a dash of sesame oil, then pile the stir-fry onto a serving plate and garnish with the sliced salad onions. This recipe was first published in Wed Mar 26 15:10:00 GMT 2014.